The Terms and Conditions outlined herein shall apply to and regulate the contractual relationship between “the Company” and “the Customer”. 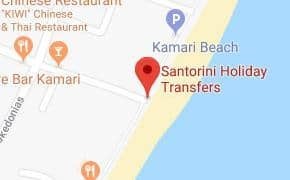 “The Company” shall refer to Santorini Transfers, including any of its authorised personnel and drivers and “the Customer” is any party who accepts an offer of the Company for the sale of its Services. “The Services” shall include, but not be limited to, any and/or all carriage, courier or delivery services, provided by the Company to the Passenger. The Services that the Company undertakes to provide shall include those specified in the Company’s sales documentation, unless expressly agreed in writing between the Company and the Customer. Any images and descriptions of the Services provided on the Company’s website, price list, marketing and other documents issued by the Company shall serve for illustrative purposes only and shall not be binding on the Company. Information contained on the Company’s website, price list, marketing and any other documentation related to the provision of the Services by the Company is subject to change at the sole discretion of the Company and without obligation to give prior notice to the Passenger. This includes, but is not limited to, any accidental errors and omissions in such documentation. Such accidental errors and omissions shall not give rise to any liability on the part of the Company. The Company reserves the right to use the services of third parties (i.e. contractors or sub-contractors) to provide Services to the Customer. The price of the Services shall be the quotation received by the Customer from the Company, unless otherwise expressly agreed in writing between the Company and the Customer. All price quotations are subject to the Passenger being ready to travel at the booked time. The Company reserves the right to alter the price of the Services at its sole discretion without any prior notice. Only those price quotations/bookings for the Services already confirmed by the Company shall be considered binding on the Company. Any pick-ups, drop-offs and other diversions shall be subject to a minimum charge of 5€ per diversion/stop. Any damage to vehicles caused by passengers due to soiling, breakage or any other cause to the similar effect is chargeable at the minimum rate of 70€ or more if the driver considers the damage to be greater. This charge is payable in cash, directly to the driver and is over and above the price for the Services quoted by the Company for the booking. Neither the Company, nor any of its drivers will accept responsibility for loss or damage to the luggage. If the Company and/or its drivers refuse to provide the Services to the Passenger, due to the Passenger carrying the items listed in clause above, cancellation fees shall apply. Neither the Company nor its drivers shall assume any responsibility for any loss or damage to the unaccompanied luggage transported in its vehicles. If the driver is unable to deliver such unaccompanied luggage to the designated recipient, for the reasons beyond his/her control, the driver will return the luggage to our head office, whereby storage and related delivery fees may apply. – Any other instances, which may be reasonably expected to cause a delay or a failure to deliver the Service by the Company to the Customer. The Company shall not be liable to the Customer for any direct or indirect loss or damage sustained in relation to the Services provided (whether or not caused by the negligence of the Company or any of its authorised personnel and drivers), unless it is expressly provided in these Terms and Conditions. The Company reserves the right to revise the Terms and Conditions at any time, at its own discretion and without giving any prior notice to the Customer.